Ergothioneine (EGT) can be produced by mycelia of mushrooms by submerged fermentation. In this study, we developed a brief method for extracting intracellular EGT. Hot water was selected as the appropriate solvent for its high safety and effectiveness during extraction process. With single-factor experiment and response surface methodology (RSM), the effects of the ratio of water to mycelia, temperature, stirring speed, processing time on the extract process were investigated and optimized. The results showed that on the conditions of the ratio of water to mycelia of 24.5: 1 (ml: g), temperature of 87.5°C, processing time of 10 min and stirring speed of 200 rpm, the extraction ratio of intracellular EGT is up to 97.1%, this method is simple and fast, thus it can be applied to industrialization conveniently. Moreover, this study showed that a small amount of extracellular EGT accumulation was observed during whole stage of fermentation, which is proposed to affect the intracellular EGT extraction and be useful for promoting EGT biosynthesis. Ergothioneine (EGT) is an L-histidine-derivative metabolite, diverse range of bacteria and fungi can potentially synthesize EGT , while plants and mammals uptake it from soil and diet respectively [2, 3]. For the existence of thiol group located on the C2 atom of the imidazole ring, it possesses antioxidant ability and thus involves in multiple physiology process in higher organisms, such as scavenge strong oxidants, chelate divalent metallic cations , filtrate ultraviolet ray , regulate oxidation-reduction reactions and cellular bioenergetics [7, 8]. In addition, since possessing the properties of stable thione structure and water soluble, it is proposed that EGT has broad applications in many areas, such as pharmaceuticals , functional food , cosmetics  and so on. In recent studies, mushrooms were discovered to be the primary source of EGT and therefore possessed high antioxidant ability . Compared with chemical synthesis and bio-extraction, using mycelia of edible mushrooms to produce EGT by submerged fermentation has great advantage in perspective of high yield, low cost, easy to industrialization and the safety of product, it can be a promising strategy for industrial production of EGT. EGT is an intracellular metabolite, for detection, preparation, purification and application of EGT, the primary step is to extract EGT from mycelia. Dubost et al used 80% ethanol to extract intracellular EGT from freeze-dried mushroom powder at 60°C , afterwards, with slight modification, 70% ethanol with dithiothreitol, betaine and 2-mercapto-1-methyl imidazole added was used as the solvent to extract intracellular EGT from mycelia, subsequently, the extract solution with mycelia were treated with sonication [14-16]. Woldegiorgis et al extracted intracellular EGT from mushroom powder by methanol on the conditions of temperature of 25°C, agitation of 150 rpm and processing time of 24 h . Zhou et al extracted intracellular EGT from Agaricus bisporus by using the following procedures: the mushroom stem were first chopped, and then broken into pieces, after filtration, NaOH solution with pH of 8.0 was added to extract EGT for 20 min, finally, extract solution with mycelia were heated up to 100°C for 6 min . Emphasis of previously extraction process was used for EGT determination, organic solvent used and complex procedures were inappropriate to industrialization of EGT preparation for the reason of higher cost and safety problems. In the research by Bao et al. , method of hot water at 95°C for 1 h was used to extract intracellular EGT from waste solid medium of Flammulina velutipes cultivation, while and extraction parameters were not further optimized, processing time was up to 1 h, materials used were different from mycelia harvested form fermentation broth as well. Moreover, though EGT produced by mushrooms is commonly considered as an intracellular metabolite, there were no relevant reports on EGT accumulation regularity in the submerged fermentation. This paper developed a brief extraction method to fit well with industrialization of EGT preparation, and investigated EGT accumulation regularity during submerged fermentation by mycelium of Pleurotus ostreatus. Strain: The EGT producing strain Pleurotus ostreatus CGMCC No.6232 was used, the mycelia were separated from the fruiting body and maintained on PDA. PDA: Potato dextrose agar (Becton, Dickinson Becton Dickinson; Sparks, MD, USA). Mycelia culture medium: 30 g/L corn flour, 15 g/L soya bean meal, 3 g/L KH2PO4, 1.5 g/L MgSO4·7H2O and 80 U/L α-amylase. Fermentation medium: 50 g/L glycerol, 35 g/L casein peptone, 3 g/L KH2PO4 and 1.5 g/L MgSO4·7H2O. Chemicals: L-Ergothioneine (purity ≥ 98%) was purchased from Enzo Life Sciences International, Inc.; methanol of HPLC grade was purchased from Bonna-Agela Technologies (Tianjin, China); acetic acid of HPLC grade was purchased from Kermiou chemical reagent Co. (Tianjin, China), respectively; methanol, ethanol, acetone, sodium hydroxide, glycerol and other chemicals of analytical grade were purchased from Sinopharm Chemical Reagent Co. (Shanghai, China). Apparatus: Chest-Type Incubator Shakers (IS-RDH1, Crystal Technology & Industries, Inc., USA); Fermenter (BIOSTAT D-DCU 75 L, Sartorius, Germany); HPLC (Agilent 1260, Agilent Technologies, USA), Water bath (TW 20, Julabo, Germany); Magnetic stirrer (WHMIXdrive 6, WIGGENS, Germany); Amicon Ultra-0.5 ml Centrifugal Filter Unit (Ultracel-3 K, Merck, Germany). Preparation of mycelia fermentation broth: A 7 day’s mycelia culture on PDA medium at 25°C was cut into approximately 1 cm2 and used to inoculate the fermentation liquid medium. The mycelia culture was grown for 4.5 days in 500 mL shake flasks with 150 mL sterilized culture medium at 25°C and 150 rpm. For fermenter cultivation, 5% (v/v) of the mycelia culture was used as the inoculum for the fermentation. The fermenter contained 45 L of sterilized fermentation medium and it was cultivated at 25°C. With the initially aeration and stirring speed were set at 10 L/min and 150 rpm respectively, the DO level was maintained at approximately 30% saturation by adjusting the aeration rate and stirring speed during whole cultivation period. Samples were taken every 12 h to analyze relevant parameters. After 14 days of fermentation, mycelia fermentation broth was harvested. Preparation of extracellular and intracellular EGT sample: Following the filtrate of the mycelia fermentation broth, the filtrate liquid and mycelia were collected respectively, and then the mycelia was washed three times with deionized water and extracted at different presetting conditions. The filter liquor and extract liquor was centrifuged at 12,840 × g (4°C) for 10 min with centrifugal filter unit, the supernatant obtained after the filtration of the fermentation broth and after the centrifugation of the mycelia extracted by water was the extracellular and intracellular EGT sample to be analyzed separately. Quantification of EGT: The EGT concentration was quantitatively determined by HPLC . The analysis was carried out on two reversed-phase C18 columns (Eclipse XDB-C18) with each column being 4.6 × 250 mm, 5 μm particle size connected in tandem. The mobile phase was 1% methanol containing boric acid adjusted to a pH of 5.0 with a flow rate of 0.7 ml/min. The injection volume was 5 μL, with the columns temperature being 25°C. An UV–VIS detector equipped with a wavelength of 257 nm was employed. Setting on extraction rate of intracellular EGT: In the research of intracellular EGT extraction, Factors that have significant effect were judged by extraction rate of intracellular EGT, of which content of extract liquor EGT was obtained on the conditions described in “preparation of extracellular and intracellular EGT sample”. Hot water and three extraction times was used to obtain content of intracellular EGT on the conditions as follows: the ratio of water to mycelia of 20: 1 (ml: g), stirring speed of 300 rpm, temperature of 90°C, processing time of 30 min and three extraction times. Statistical analysis: Origin8.5 software was used to calculate the means and standard deviations for all of the multiple measurements and to generate graphs. Each value was expressed as the mean ± standard deviation (SD). Mintab15 and Matlab2010 software was used to Response Surface Methodology experiments. The experiment for evaluating the effects of hot water on intracellular EGT extraction was carried out on the conditions as the method of “setting on extraction rate of intracellular EGT” described with slight adjustment. Hot water was used in the first two steps. In the last step: at room temperature, hot water was substituted by equal volume of methanol, ethanol, acetone, deionized water with sodium hydroxide adjusting pH to 10.0 separately to extract intracellular EGT. Results were shown in (Table 1). Table 1. Effects of extract solvent and extract times on intracellular EGT extraction. It can be seen from Table 1 that in the first extraction step, concentration of EGT was up to 109.11 mg/L, it approximate 98.6% of total EGT concentration after triple extraction process, little or none EGT was detected in the last two steps. It turned out to be that utilizing hot water could completely extract intracellular EGT with high efficiency simultaneously. Consequently, we define that content of intracellular EGT was quantified at the initial extract parameters; hot water was selected as the only extract solvent for the intracellular EGT extraction. Aqueous extraction for intracellular EGT extraction is applicable for commercial-scale preparation of EGT through large-scale fermentation process due to it is beneficial to avoid operating risks and prevent the safety problems by using organic solvents, meanwhile, the subsequent purification technology would be simplified and a wider choice of purification may be provided since noting but water is used during extraction. In the industrialization of EGT preparation, parameters such as ratio of water to mycelia, temperature, stirring speed, processing time not only affect the efficiency of intracellular EGT extraction but also involve in energy consumption and preparation cycle, for the sake of optimizing extraction process, experiments were performed as follows to evaluate the effects of different factors on the intracellular EGT extraction. With the initial temperature of 90°C, stirring speed of 500 rpm and processing time of 30 min, different ratios of water to mycelia were set as 10: 1, 20: 1, 30: 1, 40: 1, 50: 1 and 60: 1 (ml: g), respectively. And, its results were shown in (Figure 1). Figure 1. Effects of different ratios of water to mycelia on intracellular EGT extraction. It can be seen from the Fig.1 that with the increases of the ratio of water to mycelia, extraction rate of intracellular EGT increased and afterwards it kept essentially constant, the results showed that when the ratio of water to mycelia was 60: 1, extraction rate of intracellular EGT reach the maximum of 96.9%, while there was no significant difference between 60: 1 and 20: 1. Since low proportion of water to mycelia could not extract intracellular EGT completely, while high proportion could dilute concentration of EGT, so it has significant impact on the performance of the downstream operations, therefore, ratio of water to mycelia with 20: 1 was selected for the intracellular EGT extraction. With the initial ratio of water to mycelia 20: 1 (ml: g), stirring speed of 500 rpm and processing time of 30 min, different temperatures of extraction process were set as 50°C, 60°C, 70°C, 80°C, 90°C and 95°C, respectively. And, its results were shown in (Figure 2). Figure 2. Effects of different temperatures on intracellular EGT extraction. In brief, Figure 2 showed that extraction rate of intracellular EGT increased with the temperature increasing, the maximum of extraction rate of intracellular approaching 94.5% at 95°C, while it was 92.6% at 80°C, it was probably because when the temperature up to reach 80°C, cell permeability increased markedly. Thinking about energy conservation and high temperature maybe influence the stability of EGT, 80°C was selected for the intracellular EGT extraction. With the initial ratio of water to mycelia of 20: 1 (ml: g), temperature of 80°C and processing time of 30 min, different stirring speeds of extraction process were set as 0 rpm, 100 rpm, 200 rpm, 300 rpm, 400 rpm, 500 rpm and 600 rpm, respectively. And, its results were shown in (Figure 3). Figure 3. Effects of different stirring speeds on intracellular EGT extraction. Fermenter is the predominant device for EGT extraction in the industrialization of EGT preparation, taking the difference between shake flasks and fermenter in the perspective of dimensions into consideration, appropriate agitation speed is needed to ensure the homogeneous of heat transfer when extraction process is performed in the fermenter, while it is not necessary to control agitation speed accurately in industrial extraction process. With the initial water to mycelia of 20: 1 (g: mL), temperature of 80°C and stirring speed of 200 rpm, different processing times were set as 5 min, 10 min, 20 min, 30 min, 40 min, 50 min, 60 min, 90 min and 120 min, respectively. And, its results were shown in (Figure 4). Figure 4. Effects of different processing times on intracellular EGT extraction. In addition, when we extracted 10 min to 120 min, the extraction rate of intracellular EGT had no obvious changes, so it is not necessary to cool rapidly when possessing time of 10 min was reached, and it could maintain longer time at the higher temperatures, this would be beneficial to prevent microbial contamination during extraction and reduce energy for cooling. As the results shown in “effects of different factors on intracellular EGT extraction”, among the parameters that have been optimized, the ratio of water to mycelia and temperature were turned out to be the relative significance factors on intracellular EGT extraction, for the further optimization, temperature and the ratio of water to mycelia was used as independently variable, and the extraction rate of intracellular EGT was used as the response value. The factors and levels in central design were shown in (Table 2). Table 2. Factors and levels in central composite design. The design and result of RSM were shown in (Table 3) The maximum of extraction rate of intracellular EGT was observed at test 12 (96.8%), the lowest value was observed at test 2 (55.4%). Table 3. Design and result of central composite design. The data in Table 3 were regression analyzed by minitab15 software, and analysis results of variance and model reliability were summarized in Table 4. The second-order model was also obtained as Y = 93.8 – 10.98 × A + 5.92 × B + 6.25 × A × B – 14.45 × A2 – 9.8 × B2°. Table 4. Variance analysis of regression equation. The F value of model was 28.09 and values of Pr>F indicated that the model terms were significant and selectable, and the influences of A and B on intracellular EGT extraction were significant, which confirmed the fact that two factors were both crucial for the intracellular EGT extraction. Additionally, the adjusted coefficient of determination (Adj R2=91.8%) of the model indicated that 91.8% of the variability in the response could be explained by the model, so the regression equation provided appropriate model for optimizing factors during process of intracellular EGT extraction. The response surface and contour plot showed in Figure 5 were based on the regression equation. From the surface and contour surface plot, it was convenient to explain the interactions between the two variables, and also to locate their optimum levels. Figure 5. Response surface and contour plot for the interactive effects of A and B on extraction rate of intracellular EGT (Y). It could be seen from Figure 5 that the highest value of Y exceeded 97%, the optimal component for the two factors from matlab2010 software were as the following: temperature (0.48), ratio of water to mycelia (0.45) and the maximum of intracellular EGT extraction rate predicted was 97.8%. The experiment value was 97.1%, which close to the maximum predicted response. These results confirmed the validity of the model, and the best value of A and B was 87.5°C and 24.5: 1 respectively. In addition, there were large areas for predicted value of Y greater than 90%, it indicated that slight adjustment of A and B is allowed at the best conditions predicted. 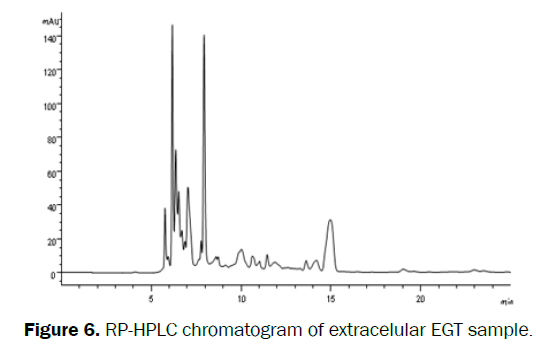 Figure 6 and Figure7 showed the RP-HPLC chromatograms of extracelular and intracelular EGT samples. Figure 6. RP-HPLC chromatogram of extracelular EGT sample. Figure 7. 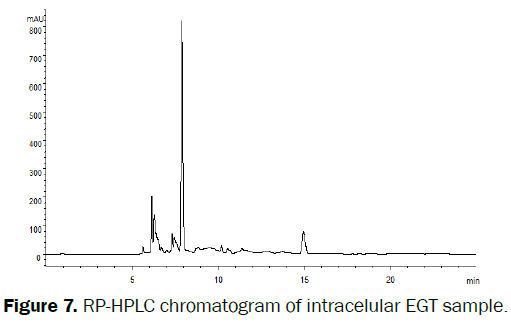 RP-HPLC chromatogram of intracelular EGT sample. Applying the parameters optimized in the result of “response surface methodology experiments”, further study was evaluated to research the EGT accumulation regularity in the submerged fermentation. The results were shown in (Figure 8). Figure 8. Regularity of EGT accumulation in submerged fermentation. Figure 8 showed that in the fermentation process, concentration of total EGT increased rapidly in the first 6 days, afterwards it increased slowly and reached the maximum of 127.3 mg/L at 12th day. Concentration of extracellular EGT increased and up to 12.0 mg/L at 3rd day, while it kept unchanged essentially later on. At the end of fermentation, the proportion of extracellular EGT was up to 14.56%, it revealed that most of EGT accumulate intracellular. Results suggested that it seems there exists mechanism that regulate the process of EGT secretion, it is difficult to unravel the underlying mechanisms of EGT accumulation currently, the fluid environment or other reasons such as DO, EGT transporter maybe the proposed reasons. EGT accumulation regularity has significant impacts on EGT production and extraction and it may be a major target for improving EGT production by regulating cell permeability to excrete EGT permeation. When much of EGT accumulate extracellular, extraction process should be adjusted to completely extract EGT from fermentation broth which contain both extracellular EGT and intracellular EGT. We developed aqueous extraction for intracellular EGT extraction. It is proper for industrialization preparation of EGT due to its higher safety, lower investment, less pollution, lower energy consumption, simpler operation, higher effective and other advantages. We found a small amount of permeated EGT in submerged fermentation. When investigating total content of EGT, proportion of extracellular EGT should be taken into consideration. Moreover, further work will focus on cell permeability regulating to research mechanisms of EGT secretion and promote EGT production. The study was sponsored from Natural Science Foundation for Youths of Tianjin, China (13JCQNJC10100) and the National Natural Science Foundation of China for Young Scholars (31100012). Jones GW, et al. The evolutionary history of the genes involved in the biosynthesis of theAntioxidant. Ergothioneine. Gene 2014;549:161-170. Melville DB, et al. On the origin of animal ergothioneine. J BiolChem 1955;216:325-331. Melville DB, et al. Ergothioneine in microorganisms. J BiolChem 1956;223:9-17. Colognato R, et al. Modulation of hydrogen peroxide-induced DNA damage, MAPKs activation and cell death in PC12 by ergothioneine. ClinNutr2006;25:135-145. Zhu BZ, et al. Ergothioneine prevents copper-induced oxidative damage to DNA and protein by forming a redox-inactive ergothioneine-copper complex. Chem Res Toxicol 2011;24:30-34. Markova NG, et al. Skin cells and tissue are capable of using L-ergothioneine as an integral component of their antioxidant defense system. Free Radical Bio Med 2009;46:1168-1176. Zembron-Lacny A, et al. Effect of Shiitake (LentinusEdodes) extract on antioxidant and inflammatory response to prolonged eccentric exercise. J PhysiolPharmacol 2013;64:249-254. BZ. Zhuet al. Ergothioneine inhibits copper-induced oxidative DNA and protein damage by formation of a redox-inactive ergothioneine-copper complex. Free Radical Biology and Medicine 2003;35:S49-S49. Paul BD and Snyder SH. The unusual amino acid L-ergothioneine is a physiologic cytoprotectant. Cell Death Differ2010;17:1134-1140. Beelman RB and Hausman MS. Use of ergothioneine as a preservative in foods and beverages. 2010; US Patent 20100076093-A1. Hyde KD, et al. Fungi-an unusual source for cosmetics. Fungal Divers 2010;43:1-9. Woldegiorgis AZ, et al. Antioxidant property of edible mushrooms collected from Ethiopia. Food Chem. 2014;157:30-36. Dubost NJ, et al. Quantification of polyphenols and ergothioneine in cultivated mushrooms and correlation to total antioxidant capacity. Food Chem2007;105:727-735. Lee WY, et al. Supplementation of methionine enhanced the ergothioneine accumulation in the Ganoderma neo-japonicum mycelia. ApplBiochem Biotech 2009; 158: 213-221. Dubost NJ, et al. Identification and quantification of ergothioneine in cultivated mushrooms by liquid chromatography mass spectroscopy. Abstracts of Papers of the American Chemical Society2005; 230: U83-U83. Tepwong P, et al. Mycobial enhancement of ergothioneine by submerged cultivation of edible mushroom mycelia and its application as an antioxidative compound. Food Chem 2012; 131: 247-258. Zhou NB, et al. Separation of ergothioneine from mushroom handle of Agaricusbisporusby alumina column chromatography. Journal of Anhui AgriSci 2010; 38:14842-14843. Bao HND, et al. Preventing discoloration and lipid oxidation in dark muscle of yellowtail by feeding an extract prepared from mushroom (Flammulina velutipes) cultured medium. Aquaculture 2009;295:243-249. Zhou T, et al. A new strategy for quantitative analysis of ergothioneine in fermentation broth by reversed phase-high performance liquid. Lecture Notes in Electrical Engineering 2014;249:313-321.